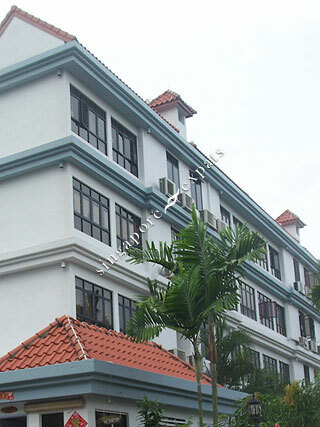 CASA SARINA is located at 101, 103 LORONG SARINA in district 14 (Eunos, Geylang, Kembangan) of Singapore. CASA SARINA is a Freehold Condo development consisting of 138 units. CASA SARINA is completed / TOP in 1998 (estimated), developed by GUAN QIAN REALTY PTE LTD.
Educational institutions like GLOBAL INDIAN INTERNATIONAL SCHOOL (EAST COAST), NPS INTERNATIONAL SCHOOL, ROSEMOUNT INTERNATIONAL SCHOOL, EUNOS PRIMARY SCHOOL, HAIG GIRLS' SCHOOL and MAHA BODHI SCHOOL are near to CASA SARINA. CASA SARINA is accessible via nearby EUNOS, KEMBANGAN and UBI MRT Stations. This is a lovely place to live; very quite ambience, lot of amenities and food centres,shopping complex etc. I love this place. pretty good for those who needs peaceful and friendly environment.